Multi-Node BBS online chat door. * * emote * * ccess * ub! in a multiline environment), such as QuickBBS, SuperBBS, and RBBS. file for info on how to set this up. anything you like (up to 400 characters), and this will be "broadcast"
the userfiles for up to 300 users. Late breaking news: RA V1.10 mentions a new "RemoteAccess Professional"
don't even know what it will look like nor what features it will have. will be specifically "stamped" as being registered to your BBS. Information on registration will appear at the end of this document. 4DOS - JP Software Inc.
First, you need to make sure that you have an acceptable "environment". are not the swiftest things were a bit slow. loaded, RAP will barf all over you. best case: on some machines, it just locks up the computer. the data through the serial port at the correct rate of speed. other .EXE files, .RAP files, .ANS files, and .ASC files. Next, change directories (the CD command) into D:\RAP. TOTAL - Create all-new system files. 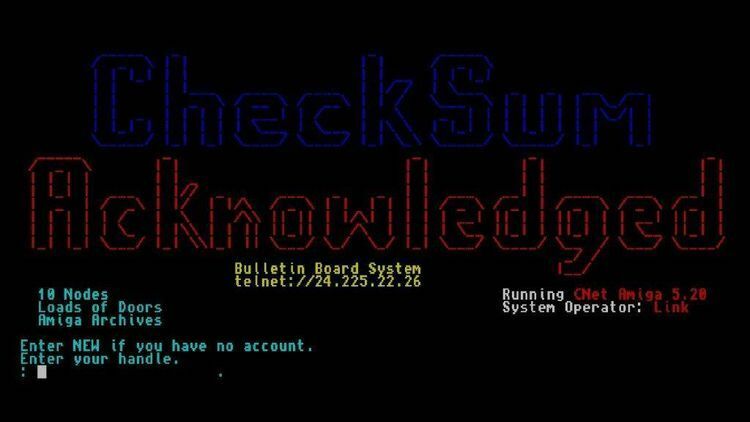 "blank" the USERON.BBS file (be sure nobody is online before you run it!). node 1, RAP1.BAT will be called. Etc. TYPE 7, or in your main BBSLINEx.BAT if you're using a TYPE 15.
be told that it is line 1. Etc. - Increasing your FILES= setting in CONFIG.SYS. the other associated *.RAP files. instructions are built-in (examples are contained in HELP.ANS and HELP.ASC). RAP assumes no RemoteAccess capabilities. loads. This includes the user file, help files, and whatnot. off (locally only, it will still ring remotely). BELL ON leaves it on. One command per line please! to be using RAP at the time. /FRED hey, how ya doin' today? This message will be sent *ONLY* to Fred. Joe *whispers* to you: hey, how ya doin' today? /FR hey, how ya doin' today? RAP will match /FR with the first online user who's name begins with FR. they're long, can be aborted by pressing the S key). RemoteAccess facilities for passing messages between BBS users. Typing ACTIONS gives a list of available actions. If the sysop enters F1, 1 minute will be added to the user's time. If the sysop enters F2, 1 minute will be deducted from the user's time. works only after the user has actually entered the Pub). There's a few other things you can add to RAP. it will be displayed to both types of user. and/or add to them all you like. respectively, in ACTION.RAP and TALKTYPE.RAP in your RAP subdirectory. message and refuse to run. So get 'em right. that I've included so that you can better visualize this). towards whom this verb is directed. %m is smiling pleasantly at %y. Joe is smiling pleasantly at you. Joe is smiling pleasantly at Fred. Joe is smiling pleasantly at everyone. n/a, if used alone on either line 3 or line 4, disables that function. by itself makes little sense, so you'd N/A the third line. Line 4 - Prompt modifier. Will be surrounded by "From " and ": "
The %y variable is invalid. %m is singing to himself. Joe is singing to himself. ALL, in which case RAP will report that "everyone" got phasered. *ONLY* that user may use. Handle: Let's you change your Handle. recommend that you leave them as they are, they *CAN* be edited by you. if that's the name of your board, anyways). (30) days, you gotta register it. Sorry! Grin! Anyways, here's the deal. Registration is $20 in *CANADIAN* currency. cheque drawn on a Canadian bank. 34 Harvest Wood Link N.E. I hope you enjoy RAPPING with your users!